FREE LIFETIME CLEANING AND INSPECTIONS* - We encourage you to bring your diamond or colored gemstone jewelry in as often as you wish for free professional cleaning* and inspection. As your hometown trusted jeweler, it is extremely important to us that your jewelry always looks its best! We recommend this be done at least every six months. *For all fine jewelry purchased from Diamonds On Main. MOUNTING GUARANTEE - For twelve months from the date of your purchase, we guarantee the mounting for your diamond or colored stone jewelry against all defects in material or workmanship. We will repair or replace any mounting without charge if any defects are found during this period. RETURN, EXCHANGE, & REFUND POLICY - Diamonds On Main exists to satisfy our customers. Unless specified below, items purchased from Diamonds On Main may be returned or exchanged for up to 15 days from the date of purchase when accompanied by the sales slip. Refunds for cash or check purchases will be given by check. Refunds on check purchases will be given after 10 business days. Merchandise must be unused and unworn and in original condition, or a fee for refurbishing will apply. Fee determined by individual circumstances. Sale items, special order, completed layaways, modified (including ring sizing) and/or custom pieces are not returnable or exchangeable. Gift certificates are not redeemable for cash. Our return policy for December purchases will be extended to Jan. 9th of the following calendar year subject to normal business hours. SPECIAL ORDERS - We regret that special orders are not returnable, and that no refund or exchange can be made. All special orders require a 50% nonrefundable deposit. A special order includes any jewelry, gemstone or repair item ordered or altered at the client’s request. CUSTOM WORK - Custom work entails use of metals, gems, and/or labor to fabricate a uniquely designed item. All custom work requires a non-refundable deposit of 50% of the item’s final cost, with a minimum of $500.00. In cases of cancellation where a custom wax model has been made and cannot be altered to accommodate the client, a minimum labor charge of $200 will be assessed, or retained from the original deposit. Full payment upon receipt of custom work denotes the client’s complete satisfaction. Minor adjustments may be made to accommodate the wearer. Fees for these adjustments will be determined by individual circumstances. We are not responsible for further damage done to a previously chipped diamond or other gemstone during the custom work process. METAL GUARANTEE - Diamonds On Main guarantees the precious metal fineness on all Gold, Sterling Silver, and Platinum jewelry. WHITE GOLD DISCLOSURE - Most white gold pieces are rhodium finished. This is not a permanent finish. LAYAWAYS - Items may be put on layaway for up to 3 months with the minimum deposit of 25%. There must be monthly activity and the item must be paid for in full by the end of the layaway period. Layaways canceled after 30 days will be subject to a 25% restocking fee. Any payments over the restocking fee will not be refunded but may be used toward the purchase of other merchandise. COLORED STONE ENHANCEMENT - Purchasers of colored gemstones should be aware that natural gemstones are processed from the time they are extracted from the earth by one or more traditionally accepted trade practices. All colored gemstones have most likely been subjected to a stable and often undetectable enhancement process. Prevailing market values are based on these universally practiced and accepted processes by the gem and jewelry trade. All relevant information will be readily provided to the best of our knowledge. 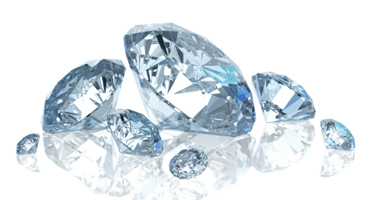 DIAMOND DISCLOSURE - All of our diamonds have been purchased from legitimate sources not involved in funding conflict in compliance with the United Nations resolutions. Diamonds On Main hereby guarantees that these diamonds are conflict-free, based on personal knowledge and/or written guarantees provided by the supplier of these diamonds: www.diamondfacts.org. DIAMOND AND COLORED STONE GUARANTEE - We guarantee the accurate grading of diamonds and colored gemstones purchased from Diamonds On Main. We also guarantee the accuracy of all diamond and colored stone weights where available. -The diamond must be in the same condition as it was at the time of purchase and be accompanied by any reports or certificates. - Purchase price of the new diamond must exceed the purchase price of the original diamond by 50%. - The Trade-In Value of the mounting will be based on its gold content calculated at current world gold price.